Edward George Bruton was born in Holywell, Oxford in 1826 and baptised at St Cross Church on 17 February (but not received into that church until 26 September 1832, when he was six years old). He was the son of Richard Bruton (then the Common Room man at New College, and later a brewer) and his wife Ruth (who was born Hurstbourne Tarrant, Hampshire, and was possibly the Ruth Nutley baptised there in 1787). Edward's three younger siblings were also baptised at St Cross Church: Mary Ann or Marianne Bruton (1828), Maria Bruton (1830, buried 1831); and a second Maria Bruton (1832). All the neat and nearly new HOUSEHOLD FURNITURE and Effects of Mr. Richard Bruton who is leaving Oxford; comprising handsome mahogany four-post, tent, and other bedsteads, with chintz, cotton, and dimity hangings, and window curtains, excellent feather beds, mattresses and bedding, mahogany chests of drawers, dressing tables and wash-hand stands, excellent mahogany dining, Pembroke, and other tables, neat mahogany hair seat and painted chairs, handsome chimney and dressing glasses, mahogany writing table and bookcase, Brussels, Kidderminster, and bed round carpets, hearth rugs, good sofa bedstead, mahogany tea chests, japanned tea trays and waiters, plated table and chamber candlesticks, dinner and tea services, china, glass, excellent clock in an oak case (by ROWELL), a good gun, fenders and fire irons, the usual culinary articles, &c. which will be described in catalogues. It is uncertain where the family went to live in June 1834. Two years later Edward's father Richard Bruton was dead, as a notice appeared in Jackson's Oxford Journal on 3 December 1836 stated that all persons having claims or demands on his estate should remit particulars to Mr T. Ward, solicitor of 117 High Street, Oxford. By the time of the 1841 census the family was back in Oxford. Edward (15) was now apprenticed to the architect John Plowman and living with him and his family at his home in King Street (the part of Merton Street that runs south from the High Street). The Brutons had come down in the world since the death of Edward's father, as his mother Ruth (52) and his sister Mary Ann (13) were also living with the Plowmans and employed as their servants. One of Edward's first architectural commissions was the lodge of St Sepulchre's Cemetery, which he designed as part of the original plan in 1848 when he was only 22 (although it was not built until 1865). The family fortunes soon improved, and in 1851 Edward (25) was living at St John Street, Oxford: he was described as the head of the household, and his widowed mother Ruth (62) and his sister Maria (18) were living with him. In July 1852 when his designs for the Industrial School at Cowley were advertised for inspection by builders, his address was specified as 28 St John Street. Charlotte Sophia Jacob was born at Roseman Street, Clerkenwell, London on 22 February 1824 and baptised at St Andrew's Church in Holborn on 22 June 1824. She was the daughter of Henry Jacob (a stationer born in Marylebone who was later a magistrate's clerk) and Charlotte Balmforth (born in Holborn), who were married at that church on 22 June 1824. Her two older siblings were also born in London: Mary Harwood Jacob (1819) and George Jacob (1822). When Charlotte was about two years old, the family moved to Oxford, and her five younger siblings were baptised at St Ebbe's Church: Stephen Charles Roberson Jacob (1827), Anne Jacob (1829), Maria Jacob (1830), Matilda Jacob (1832), and Sarah Haines Jacob (1834). At the time of the 1841 census Charlotte (15) was living in Pembroke Street, St Ebbe's with her parents, her older siblings Mary and Henry, who was an apprentice carver & gilder, and her younger siblings Stephen (14), Anne (12), Maria (10), Matilda (8) Sarah (6), and Ellen (4), plus their servant. In 1851 Charlotte (26) was still at home there with her parents and four of her siblings..
Charles Edward Bruton II (born in Ss Philip & James's parish in 1865 and baptised at that church on 29 September). Edward and Charlotte Bruton began their married life at Edward's house at 28 St John Street in St Giles's parish. In 1853 Edward Bruton designed the added apse to St Paul's Church in Walton Street, and In 1854 the Town Hall in Banbury. In the latter year his first book, Private halls and collegiate additions: their architecture and ecclesiology was published in Oxford: online here. He and his family moved to Beaumont Street in St Mary Magdalen parish in 1857, and his baby daughter Matilda Ada Bruton was born there on 24 October 1857. Her birth notice in Jackson's Oxford Journal stated that she had been born prematurely, and she died at the age of two days and was buried in St Sepulchre's Cemetery 1857, possibly in the infants' section in the St Mary Magdalen area. At the time of the 1861 census Edward (35) was living at 14 Beaumont Street with his wife Charlotte (37) and their children Ellen 97), Edward (6), George (11), and Charles (1), and his mother Ruth (71). They also had a lodger and two servants. In 1862 he designed 62 Banbury Road. His son Alex was born in 1864. The first of their two sons to be given the name Charles Edward Bruton died at The Crescent, Park Town at the age of five and was buried in the St Mary Magdalen section of St Sepulchre's Cemetery on 19 November 1864. He is likely to be the first person buried in this grave, although he is not recorded on the headstone. The same name was given to their next and last child who was born the following year. In 1865 Bruton's book Ecclesiastical dilapidations: a few words on the law thereof was published in Oxford: online here, and about this time he designed Springfield at 33 Banbury Road. In 1866 he designed Christ Church Old Buildings in the Hamel; in about 1867 23 Banbury Road, and in 1868 64 Banbury Road. On 18 May 1867 Edward George Bruton was appointed Ensign of the Second Oxfordshire Rifle Volunteer Corps. In that year he designed a new library for All Souls College, built at the end of the old one. 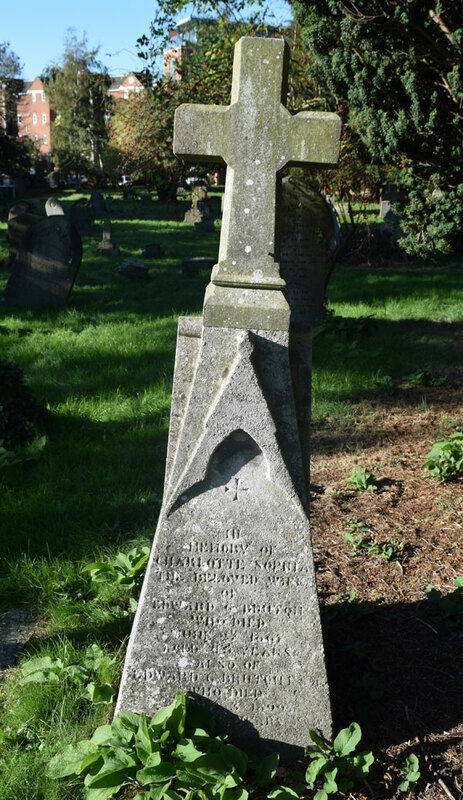 † Mrs Charlotte Sophia Bruton née Jacob died at The Crescent, Park Town at the age of 43 on 27 June 1867 and was buried at St Sepulchre’s Cemetery on 2 July (burial recorded in the parish register of St Mary Magdalen Church). Her death notice in Jackson's Oxford Journal read: “June 27, at Park Town, Oxford, of consumption, Charlotte, the beloved wife of Mr. Edward G. Bruton, of this city, architect.” The fact that she was buried in the St Mary Magdalen section of St Sepulchre's Cemetery indicates that this grave had already been used for at least one of her children, as if there had been no pre-existent grave she would have been buried in St Giles's parish. 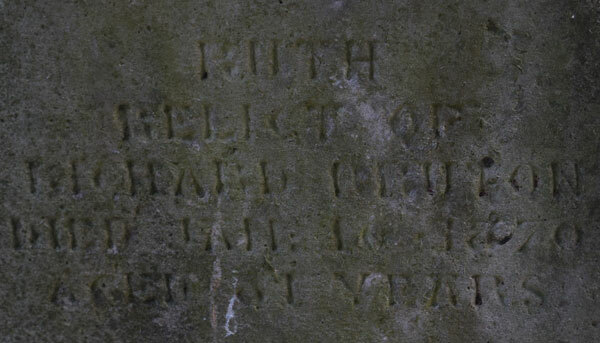 † Mrs Ruth Bruton née Jacob died in the Ss Philip & James district at the age of 81 on 10 January 1870 and was buried at St Sepulchre’s Cemetery on 13 January (burial recorded in the parish register of St Mary Magdalen Church). In 1870 Edward's book Ecclesiastical dilapidations: the qualification and practice of surveyors considered was published in Oxford, followed in 1871 in London by A handy-book on the Ecclesiastical Dilapidations Act 1871. Also in 1871 he had three articles published in the Proceedings of the Oxford Architectural and Historical Society, namely “The recent discovery of wall-paintings on the apse of Checkendon Church”, “Apsidal churches”, and “Cogges Church”. In that year he also designed St John the Evangelist Church in New Hinksey (demolished 1900), and a new chapel for Cowley College. Edward's sister Mrs Marianne Baker died in Adelaide, Australia on 30 June 1870, and it was probably he who placed the notice of her death in Jackson's Oxford Journal. At the time of the 1871 census Edward, a widower of 45, was living at Wychbourne at the south end of the Woodstock Road (then called St Giles's Road West) with his unmarried sister Maria (38) and his six surviving children Ellen (17), Edward (16), George (15), Charlotte (9), Alexander (7), and Charles (5). They also had a lodger and a boarder, and a general servant and a nursemaid. They continued to live at Wychbourne at the start of their marriage, but In 1873/4 moved to The Crescent at Park Town. On 25 January 1873 at the age of 16, Edward's eldest son George Charles Bruton was matriculated at the University of Oxford as a non-collegiate student, which meant that he could continue to live at home while he studied. In 1873 Edward Bruton designed Ss Peter & Paul Church, Broadwell; in 1874 the rebuilt St Mary's Church, Hardwick; in 1875 the rebuilt St John the Baptist Church, Stadhampton; in 1876 St Michael's Infant School in New Inn Hall Street; and in 1880 Chipping Norton Vicarage. † Charlotte Maria Jacob Bruton died at The Crescent, Park Town at the age of 19 in November 1880 and was buried at St Sepulchre’s Cemetery on 2 December (burial recorded in the parish register of St Mary Magdalen Church). On 5 January 1881 at Ss Philip & James's Church, Oxford, George Charles Percy Bruton (24), described as a clerk in holy orders of Rosscarbery, married Katherine Frances Greatbatch (24) of The Cedars, Park Crescent, the daughter of Levi Greatbatch (who was now described as a gentleman). At the time of the 1881 census Edward (55), who was now the Diocesan Surveyor as well as an architect, was living at 1 The Crescent, Park Town with his second wife Emma Jane (39) and their children Constance (8), Maud (7), Katie (5), and Arthur (3). Two of his children from his first marriage were still living with him: Ellen (27), and Charles (15), who was an architect's pupil. They employed a nursery governess and two domestic servants. Edward's two sons by his first marriage had both left home: Edward (26) was an architect's assistant, boarding in Cardiff with the widow Mrs Mary Jane Price (35) and her four sons, and Alexander (17), was an assistant master at Hele's Grammar School in Plympton, Devon. In the second quarter of 1882 in Cardiff, Edward Henry Bruton (26) married his landlady Mrs Mary Jane Price, née Morgan (36), who was born at Haverfordwest, Pembrokeshire. In 1882 Edward Bruton designed St Edburg's Hall in Bicester and St Bartholomew's Vicarage in Holton. From 1886 he designed the roofs of Oxford's Covered Market. By 1887 Edward Bruton was had also been appointed the City Surveyor of Oxford. In 1890 he designed St Mary's Rectory in Souldern. In 1891 only Edward (65) and his consumptive son by his first marriage Charles (25), who was an architect, were at home at 1 The Crescent, with their cook and housemaid. His wife Emma Jane Bruton and her four children were away from home: they are hard to find in the census, and may have been in Scotland or abroad. † Charles Edward Bruton II died at The Crescent, Park Town at the age of 25 on 1 May 1891 and was buried at St Sepulchre’s Cemetery on 5 May (burial recorded in the parish register of St Mary Magdalen Church). In 1891 Bruton's book The Town Walls of Oxford was published in London. † Edward George Bruton died at 20 Museum Road at the age of 73 on 3 August 1899 and was buried at St Sepulchre’s Cemetery on 5 August (burial recorded in the parish register of St Mary Magdalen Church). On 16 December 1899 in Paris, Maud Marion Bruton married George J. Wallau. In September 1907 in the Steyning district of Sussex, Constance Mary Bruton (45) married Archibald William Carter (born in Greenwich in 1875), who lived in the parish of St James the Less, Lancing, Sussex. The banns were called at St Giles's Church in Oxford on 1, 8, and 15 September. By 1911 Emma Jane (69) had moved to East Croydon and was living at 61 Addiscome Road there with her two unmarried children Katie (35) and Arthur (33). Edward's second wife Emma Jane Bruton at 68 Saltoun Road, Brixton at the age of 75 in April 1917 and was buried at Norwood Cemetery on 11 April (Grave A52154). On 23 June 1921 at Christ Church, Streatham, London, Katie Ella Bruton (45), described as an architect of 482 Streatham High Road, married Albert Victor Scarlett Scullard (44), a chartered accountant of Streatham Hill. Ellen Charlotte Bruton (born 1853), who continued to live with her father and stepmother, never married. She is hard to find in 1891, and may have been abroad with her stepmother and half-siblings. In 1901 Ellen (48) was a guest at the Convent & Orphanage of the Sisters of Bethany in Bournemouth. In 1911 she was the head of the Annunciation Mission House at 10, 11 & 12 Washington Street, Bournemouth. She is probably the Ellen C. Bruton whose death was registered in the Poole district in the third quarter of 1934: she would have been 81, but is recorded as 84. Edward Henry Bruton (born 1854) and his wife Mary Ann do not appear to have had any children. In 1891 he was an architect, living at 181 Richmond Road, Cardiff with Mary Ann and two of his stepsons, plus a servant. In 1901 Edward (45) was living at 160 Newport Road, Cardiff with Mary Ann (56) and three of his stepchildren, plus a servant. By 1911 Edward (56) was retired, and was living in Somerset with his wife plus their 14-year-old servant girl at Kildare, Berrow, near Burnham. He is probably the Edward H. Bruton whose death was registered in the Poole district at the age of 71 in the second quarter of 1926. George Charles Percy Bruton (born 1856) and his wife Katherine returned to Ireland after their marriage, and George was ordained Priest in 1882. They had two children in Ireland: Harold George Bruton and Norman Martin Bruton. George served as Principal of St Faughnan's College, Ross from 1885 to 1892, and was Rector of Rathoarry, Ross from 1892 to 1895. He then resigned and returned to England. He was appointed Vicar of Great Haywood, Stafford in 1896, and his youngest daughter Evelyn Frances Bruton was born there in 1898. 1901? At the time of the 1911 census George (54) was living at Great Haywood with his wife Katherine (54) and their daughter Evelyn (12), plus their servant. He may be the George C. Bruton who died in Birmingham at the age of 64 near the end of 1920. Alex Frank Bruton (born 1864), later known as Alexander, never married. In 1891 he was aged 27 and an assistant schoolmaster at Doncaster. He is hard to find in 1901, but in 1911 when he was 47 he was paying a visit to his half-sister Mrs Constance Carter in Croydon. He died at 7 Elm Grove, Taunton at the age of 61 on 22 June 1925. His effects came to £390 4s. 9d., and his executor was his half-sister Mrs Katie Ella Scullard. Constance Mary Bruton, Mrs Carter (born 1873) was aged 37 in 1911 and living at 7 Teevan Road, Addiscombe, Croydon with her husband Archibald Carter (36), who was a marine insurance broker, and their son Cyril Archibald Bruton Carter (2); and her half-brother Alex was paying them a visit. They appear to have a second child, Constance R. Carter, in the Epsom district in 1912. Maud Marion Bruton, Mme Wallau (born 1874) returned with her husband George Wallau to New York after their marriage in Paris in 1899 and had three daughters: Sylvia, Germaine, and Jacqueline Wallau. Katie Ella Bruton, Mrs Scullard (born 1876) and her husband Albert Scullard had no children. Katie was living at 33 Carshalton Park Road, Carshalton, Surrey when she died at Netherne Hospital, Coulsdon at the age of 80 on 19 December 1957. Her effects came to £213 12s. 5d., and her executor was a Miss Helen Mary Atkinson. Arthur Martin Bruton (born 1878) was still living with his mother in Croydon at the age of 33 in 1911 and working as a bioscope operator at the Queen's Hall there. In the second quarter of 1915 in Lambeth, he married Margaret M. A. Pike, and their son Eric D. Pike was born in Wandsworth in 1917. He is probably the Arthur M. Bruton who died in the St Albans district in the second quarter of 1961 at the age of 83. A search for Bruton in the Oxfordshire Buildings Index reveals many of the other buildings which he designed.